Scott Brodie had been rubbing his chin, contemplating buying a larger scooter to be able to keep up on group rides. 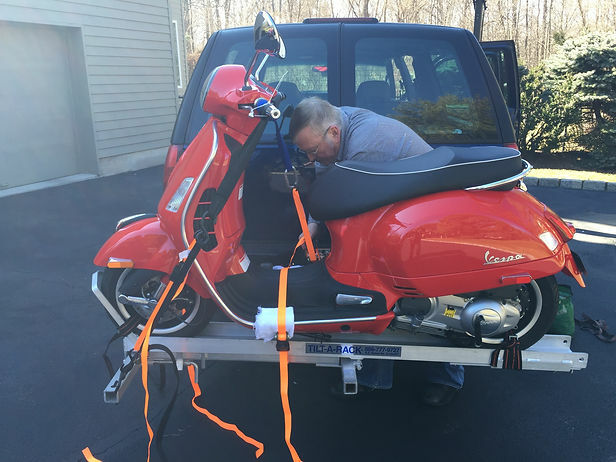 He found a pristine 2013 Vespa GTS Super 300 on craigslist down in Palisades, NY. A couple of weeks ago, Kunter, an A Town Rumbler, was retiring and moving south, so he gave away a deluxe aluminum bike hauler which fits a 2″ trailer hitch receiver. John “Bloop” Conner beat me to it, buI had the truck it would fit and the place to store it. So early Saturday AM saw the Tremendous Trio, Scott, John, and myself climbing into my Suburban with the carrier attached and making our way down the Thruway. It was a beautiful day, the trip went without problems, the seller was a great guy, the bike hauler performed flawlessly, and the Vespa was stunning! 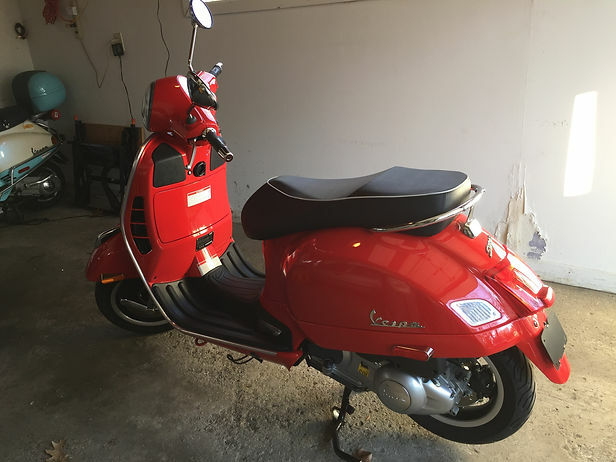 We’ll let Scott brag about his new purchase, suffice it to say he got a wonderful new “dragon” red Vespa GTS Super 300 at a reasonable price and it’s now in his garage next to Nelli, his faithful Vespa 150. There will be updating reports on the love triangle in Scott’s garage! Two sidebars: The bike hauler functioned better than cheaper models on its maiden voyage. The tilting feature, ramps, and tie down locations were excellent. And second, the gps rather quickly placed us on the Palisades Parkway, a roadway which prohibits trailers. Good thing we hadn’t borrowed Chuck Price’s trailer! Previous post: The Rumblers Visit / Terrorize Martha’s Vineyard!